We slightly modified some notations to be conform with the notations of KnowWE. The used markups for the definition of the ontology can be only seen in the EDIT mode of this wiki page. Thus, when you want to understand how the definitions work, please move to the EDIT mode or choose "More/View Page Source". Photo of James Dean: License CreativeCommons by-sa-2.0 / find the original file here . 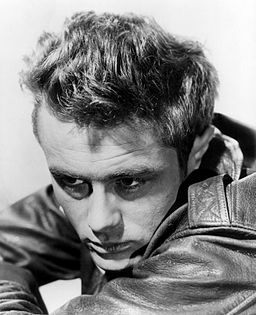 We first need to define the namespace, where all elements of the James Dean knowledge base should be located, i.e., jamesDeanMovies. Then, we define the knowledge base itself, giving it the namespace/package it should use. To connect some RDF instances properly in KnowWE, we first need to define some classes and their properties. The classes can be also defined separately and on different wiki articles. We first define some ontology instances in RDF. We now connect the instances defined above by using the turtle markup. When the subject and the predicate of two triples is equal, the you can simply separate the differing objects by commas. See, the playedIn relation for instance. We now try to retrieve some information, that we before represented as triples. Lets see the actresses that played together with James Dean in a movie. We use the NOT IN filter to omitt the appearance of James Dean himself in the result set. When the result set consists of more than one element, the result is displayed as a table. Lets see, what directors worked in movies where James Dean played in. When the result set consists of one element, the result is displayed as a list of the element values. By now we only have seen the names of the actual instances. In RDF it is also possible to define (language dependent) labels for instances by the property rdfs:label. Please note, that we use general labels for actors and directors, but language dependent labels for the names of movies. We are now able to query the RDF store with the labels, for instance, query all actors and the movies (in english language) they played in.